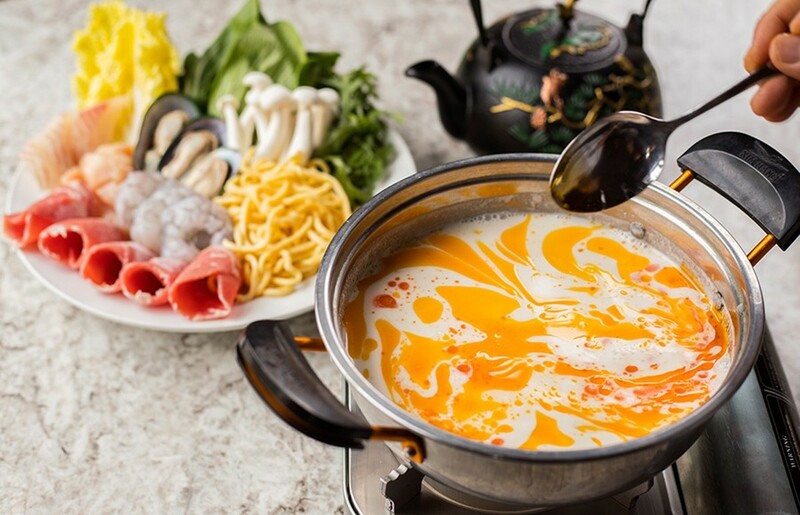 The "Thai Tom Kha Hot Pot: includes veggies, chicken, shrimp, white fish, green mussels and noodles. Duncan Pham is a born cook, a talent that revealed itself even in the most difficult of circumstances. Growing up in Vietnam in the mid-1970s, amidst the chaos and terror of war and oppression, young Pham took solace in food, even before he had any inkling he was destined for the kitchen. At first, his skills manifested as a penchant for fishing — as he not only caught whatever bounty the waters would give up but designed his own implements. He fashioned innovative eel traps out of tin cans, used a string of cans to catch octopuses and even designed a special slingshot that proved way more effective for catching fish than the traditional methods. That innovation would come in handy for Duncan and his siblings, Victor and Mina, when they were forced to flee Vietnam in 1981. Traveling by boat, the siblings survived by foraging what they could find on islands along the way, and eventually set up a small bamboo tent in a refugee encampment on the beach in Thailand. There, Duncan was the family's resident fisherman, an impressive distinction given that he was only eleven. The Phams were in Thailand for six months before moving to the Philippines to await entrance into the United States. Once they arrived stateside, they settled in Florida with their father, who had already made the journey. 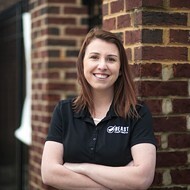 After getting acclimated to their new home, Duncan naturally ended up in the food business, scoring a job at a sushi restaurant. If Duncan was the chef of the family, Victor was the entrepreneur, always on the lookout for business ventures even when he was a schoolkid. After graduating high school, Victor left Florida to join one of his siblings in St. Louis and was immediately struck by the dearth of sushi restaurants. Sensing an opportunity, he bought a building on South Grand, rehabbed it and recruited his brother and sister to help him run the place. Together, the three opened Café Mochi in 1989. The cafe's always-full patio tells you all you need to know about the success the Phams have enjoyed. The restaurant has become something of a South Grand institution, an oft-recommended place for sushi and Japanese cuisine with a legion of regulars. In fact, the restaurant's reputation is what led the Pham siblings to their latest concept, VP Square, which opened just a few blocks away from Café Mochi this past February. 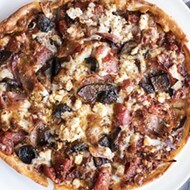 Though they weren't actively looking to open a new spot, the owner of the building at Grand and Juniata knew of the Phams' reputation as tireless restaurateurs. 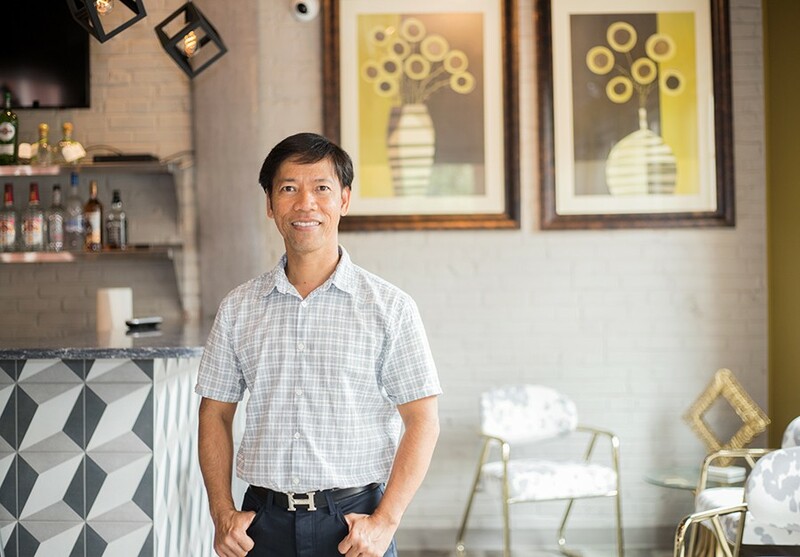 He approached Victor to see if he was interested in taking over the building, and before they knew it, the siblings were hard at work converting a former hair salon and office space into their second restaurant. For VP Square, the Phams wanted to do something that felt more personal than sushi — something that evoked not only their homeland but the stops they'd taken along the way on their journey to the U.S., as well as the rich culinary traditions of other countries throughout Asia. 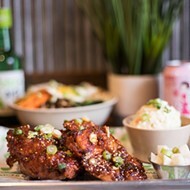 In that spirit, VP Square is an "Asian fusion" restaurant that features dishes from culinary traditions as diverse as Vietnam, Thailand, South Korea and China. Bibimbap next to Szechuan hot pot, bánh mì alongside tonkotsu ramen — for a lesser chef it would be overly ambitious, but for the talented Duncan Pham, it's effortless. 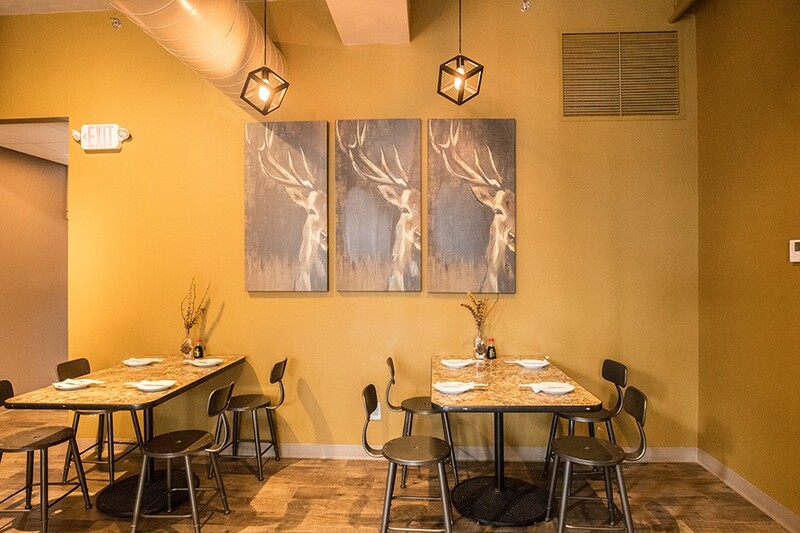 The main dining room features antler-themed decor. 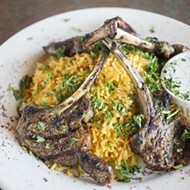 It's also flawless, each dish more dazzling than the next in both flavor and execution. Take the crab Rangoon, an appetizer usually offered as a straight-from-the-freezer throwaway. At VP Square, it may be the restaurant's signature dish, a half-moon-shaped wonton that is as crisp and delicate as a paper-thin potato chip. Somehow, that dainty wrapper is able to contain a cream-cheese filling so interspersed with crabmeat and scallions it could be considered a crab salad. Chef Pham would never dare serve such a masterpiece with cloying, pre-made sweet and sour. Instead, he pairs his Rangoons with a vibrant housemade sweet-and-sour sauce spiked with chiles. There is not a better crab Rangoon in town; there may not be a better crab Rangoon in existence. Duncan's sushi skills shine through on the tuna tartare. The soy-slicked cubes of ruby-hued raw tuna are paired with avocado and served atop light-as-air wonton chips. Thickly sliced green onions add a pungent punch to the silken fish. It's simple, fresh and perfect. "Starburst Summer Rolls" are VP Square's take on a traditional Vietnamese spring roll. In addition to the usual vermicelli and cilantro, the chef adds crab, shrimp and strawberries into the sticky rice-paper roll, then pairs the appetizer with velvety soy-and-peanut sauce for dipping. The mix of texture, sweet, salt and refreshment is stunning. 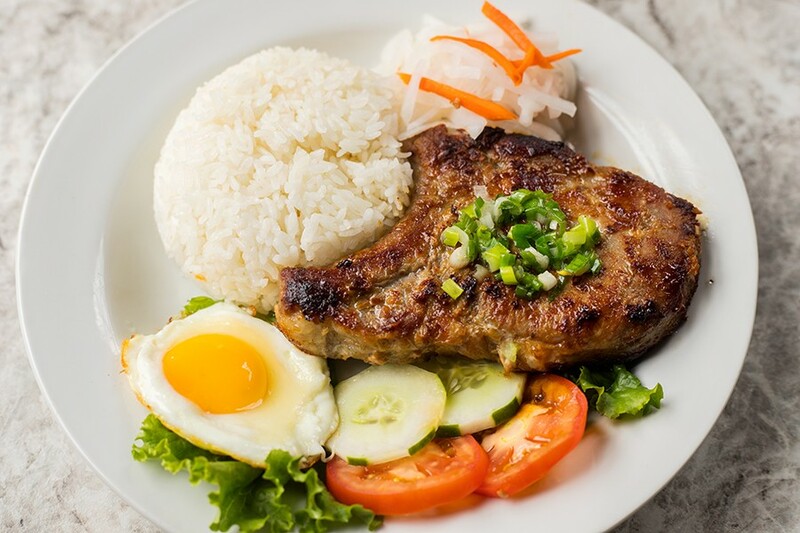 VP Square's char-grilled lemongrass pork chop is served with steamed rice and lime fish sauce. Even a simple fried-rice dish is an event at VP Square. Loads of garlic and fresh basil leaves spike the stir-fried rice, adding a layer of complexity to the soy-sauce base. The dish comes with a garden's worth of fresh vegetables, but you can choose to add chicken or shrimp. I opted for the latter and was treated to plump, perfectly cooked shellfish that paired seamlessly with the other components. A pork chop nearly two inches thick is scented with lemongrass then kissed with bitter grill char. The combination of floral perfume and grilled meat is positively intoxicating on its own, but when dipped in the accompanying funky lime-spiked fish sauce, it's otherworldly. The pork was a touch overcooked (I prefer medium and this was cooked throughout), but the egg that accompanied the dish was flawlessly prepared; the white was plump and silken, the yolk in a suspended state between liquid and solid. Miso-cured salmon was another success. The large filet was tender and pulled apart into flakes the texture of flower petals. The fish sat atop a bed of noodles specked with cod roe. The fish eggs clung to the salmon, noodles and accompanying seaweed salad, tying everything together in a pleasant sea-flavored bow. 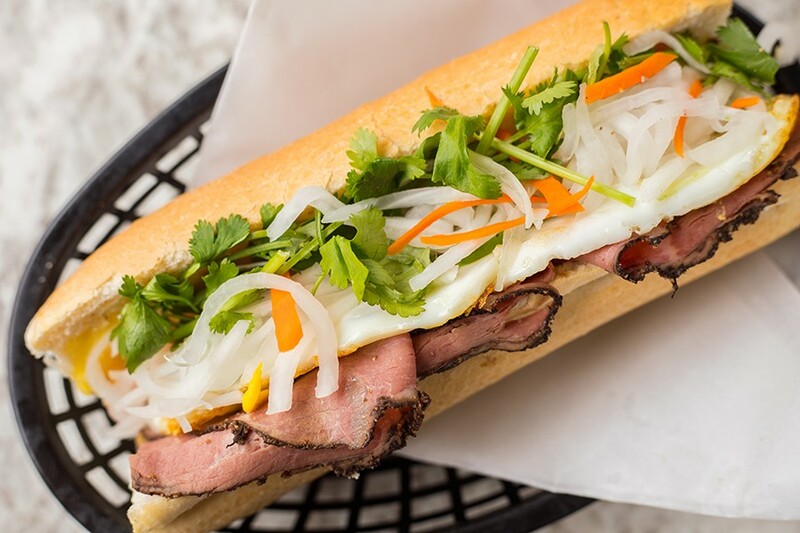 The beef pastrami bánh mì is topped with a sunny-side-up egg, pork pâté, pickled radish and carrots, jalapeño, cucumber and cilantro. Like the fried rice, the tofu yaki udon reads like a straightforward presentation: wheat noodles, tofu, cabbage, bean sprouts and assorted julienne vegetables. However, the quality of noodles transforms it into a work of art. The yaki udon are silken ropes, gilded with just a touch of a sticky soy glaze that enhances their nutty flavor without covering it. How a chef can dazzle with such simple ingredients is mindboggling. Aside from the crab Rangoon, this may be my favorite dish. Duncan Pham's foray into Korean and Chinese food is, unsurprisingly, a success. The bulgolgi on the bibimbap is sweet, salty and as tender as pot roast. Even the carrots are a showstopper, subtly spiked with a sweet chile sauce. It's as good as any version I've had in town. The same goes for the Szechuan-style hot pot, its mouth-tingling, rich beefy broth a master class in layering spice. You could enjoy this food in a shack and be content, but Victor Pham shows off his knack for style in the building's décor. The two-story restaurant is outfitted in serene colors with taupe and pale mustard walls. Upstairs, where the bar is located, exposed, whitewashed brick and brass accents create a contemporary scene, while downstairs, grey marbled-looking tabletops and of-the-moment chandeliers fashioned from antlers give the room a rustic feel. 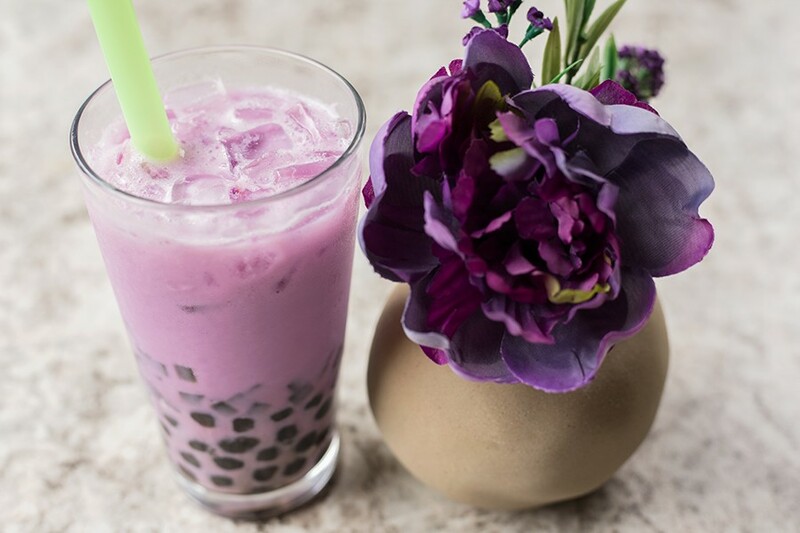 Taro bubble tea with tapioca pearls and green herb jelly. Victor Pham is also using part of the downstairs space as a bubble tea and smoothie shop. You can order one of his soon-to-be-legendary avocado smoothies for dessert or stop in and grab one to go — it doesn't matter where you enjoy it. You'll be transported to another plane regardless your surroundings. In fact, that feeling will hit you time and again at the thrilling VP Square. Café Mochi may have been the restaurant that established the Pham siblings, but the new place seems like the one they were always destined to own. 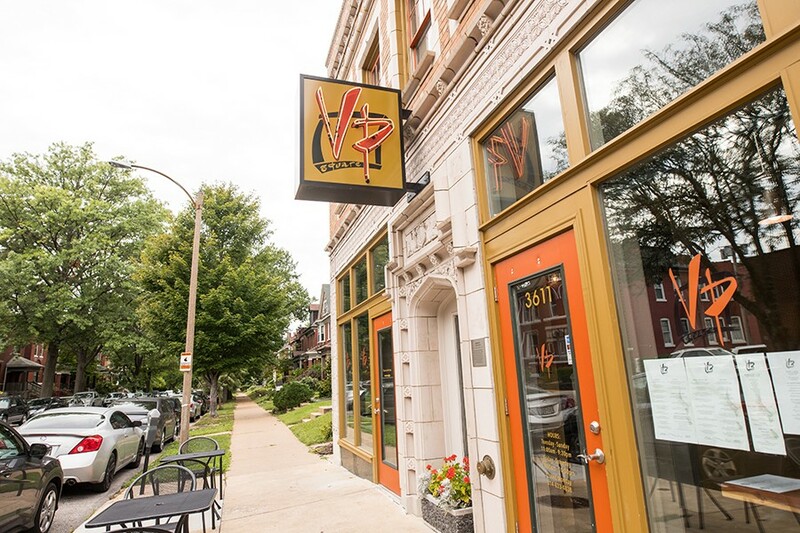 That destiny may go back all the way to their childhood in Vietnam, but now, it flourishes right here in St. Louis.